As we enter the holiday season, and it’s celebrations of light, of togetherness, of kindnesses great and small, I am reminded again how holiday cheer sees us through the darkest time of year. 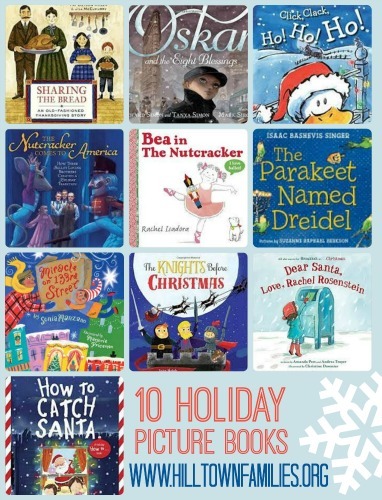 Here are ten new picture books that embody the wonder and love of the holiday season. Sharing the Bread – An Old Fashioned Thanksgiving Story is a book to be read aloud. The lyrical text presented in rhyme is ideal for sharing, much like the bread this 19th century family bakes. “We will share the risen bread./ Our made-with-love Thanksgiving spread./ Grateful to be warm and fed./ We will share the bread.” The family also shares in the work it takes to create a huge Thanksgiving feast. Each person, from child to grandparent, has their own special job in helping make the holiday special. Home-spun illustrations pay ode to the time period with an old-fashioned look. A warm and cheerful read that embodies the spirit of Thanksgiving. The Nutcracker Comes to America: How Three Ballet-Loving Brothers Created a Holiday Tradition is a story that ballet aficionados and young history buffs will find fascinating. It’s the story of how three brothers – William, Harold, and Lew Christensen – were responsible for producing the first full-length production of Tchaikovsky’s The Nutcracker in the Western Hemisphere. Originally from Utah, these ballerinos performed on vaudeville, danced in the New York City scene, and started a decades-long holiday tradition when they produced The Nutcracker with the San Francisco Ballet on Christmas Eve, 1944. It was a huge hit, spreading across the country, and carrying on through 70-plus years. Author notes and a timeline at the end provide even more information. A picture book for anyone who is nuts about The Nutcracker. Oskar and the Eight Blessings is an emotionally elegant story about a young refugee who arrives in New York City on the last night of Hanukkah, which is also Christmas Eve. It is 1938, and Oskar has escaped the horrors of WWII and Kristallnacht. Alone and afraid in a big city, he holds on to his father’s parting words: “Oskar, even in bad times, people can be good. You have to look for the blessings.” Now he must walk to his aunt’s house, 100 blocks away. He wants to make it there before sundown, before his aunt lights the 8th candle on the menorah. Illustrations in different sized panels help move the story down the entire length of Manhattan. As Oskar walks, focusing on his father’s wisdom, he receives small kindnesses from people along the way. So even as the day grows dark, Oskar’s hope grows bright. A heartfelt story with a timely message. The Parakeet Named Dreidel, a story by Isaac Bashevis Singer, was originally published as part of collection of Hanukkah stories in 1980. (The Power of Light, Farrar, Straus and Giroux), and is now adapted for a picture book with colorful, emotive illustration. A father tells the story of how on a frosty Hanukkah night, a parakeet flies into the window of his family’s Brooklyn apartment. They let the bird in and discover it speaks Yiddish. They name the parrot Dreidel and it becomes their beloved pet. Ten years later, his son David, meets a woman named Zelda, who owned the parakeet when she was a girl. When David and Zelda decide to get married, everyone is relieved that Dreidel can stay in the family. A loving, family-centered Hanukkah story. The Parakeet Named Dreidel written by Isaac Bashevis Singer, illustrated by Suzanne Raphael Berkson. Published by Farrar, Straus and Giroux, 2015. ISBN: 978-0374300944. Miracle on 133rd Street shows how one family’s problem becomes a neighborhood miracle. When Mami can’t fit the roast into the oven on Christmas Eve, the family decides to bring it to the local pizzeria, where the pizza oven is surely big enough to cook a roast. As they proceed down the floors of their apartment building and out onto the city street, they find that many of their friends and neighbors seem to have lost the Christmas spirit. Something changes however, as the family carries the cooked roast back home. The warm, delicious aroma has a magical effect on everyone they pass, working a Christmas miracle, and bah humbugs suddenly have a change of heart. Colorful pictures, full of energy and life, mirror the vibrant holiday celebration of family and friends. Miracle on 133rd Street written by Sonia Manzano, illustrated by Marjorie Priceman. Published by Atheneum Books for Young Readers, 2015. ISBN: 978-0689878879. Bea in the Nutcracker is just right for the smallest sugarplums. Bea’s toddler ballet class is going to perform The Nutcracker and she will be dancing the part of Clara! Her friend Sam will be the Nutcracker. Simple, straight-forward text works with line drawings and colored paper collage to make The Nutcracker easily accessible to even the youngest audiences. A warm story sweetened with a bit of humor. Bea in the Nutcracker by Rachel Isadora. Published by Nancy Paulsen Books, 2015. ISBN: 978-0399252310. How to Catch Santa is an instructional how-to guide for any kid who wants to catch the big guy in red. A brother and sister talk readers through the process of catching Santa on Christmas Eve, sharing plenty of do’s and don’ts. Riddles and cookies are highly recommended, while lassoes and giant candy canes are not. Detailed pictures aid young sleuths in their pursuit of the elusive Santa Claus and show hilarious scenarios sure to inspire some belly-shaking laughter. How to Catch Santa written by Jean Reagan, illustrated by Lee Wildish. Published by Alfred A Knopf, 2015. ISBN: 978-0553498394. Dear Santa, Love, Rachel Rubenstein is the story of an earnest attempt by a young girl to celebrate the Christmas holiday. Rachel Rubenstein loves Christmas – the lights, trees, decorations, and Santa Claus. Everyone on the block celebrates Christmas, everyone except Rachel and her family. That doesn’t stop Rachel from writing to Santa, visiting him at the mall, and leaving latkes out for him and his reindeer. Despite her best efforts, Santa does not show. Rachel must untangle her feelings about her identity. But when she sees other kids who don’t celebrate Christmas, she feels comforted and reassured in her own family’s celebrations. A story with humor and heart that many kids will relate to. Dear Santa, Love, Rachel Rosenstein written by Amanda Peet and Andrea Troyer, illustrated by Christine Davenier. Published by Double Day Books for Young Readers, 2015. ISBN: 978-0553510614. The Knights Before Christmas is a parody of the classic poem, Night Before Christmas. Featuring three castle knights who try to repel Santa who they mistake for an intruder. But Santa will not be deterred, and is determined to deliver his gifts to the knights. Totally silly and clever, with cartoony digital illustrations. Knight lovers will get a jest out of this holiday tale. Click, Clack, Ho! Ho! Ho! is the newest book in the Farmer Brown and Duck series that started with Click, Clack, Moo (Atheneum, 2000). It’s Christmas Eve and Farmer Brown is hanging stockings when he hears something stirring outside. He thinks it might be Santa, but it is really Duck pretending to be Santa. When Duck gets stuck in the chimney, the other animals try to help, though quite unsuccessfully. The expressive body language of the animals combined with the humorous storyline make this slapstick holiday story an amusing prelude to the big event.